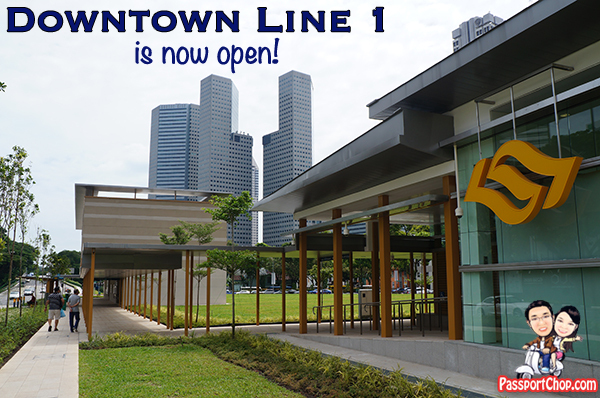 The new Downtown Line 1 (DTL1), consisting six new stations – Bugis, Promenade, Bayfront, Downtown, Telok Ayer and Chinatown, had commenced service on 22 December 2013. 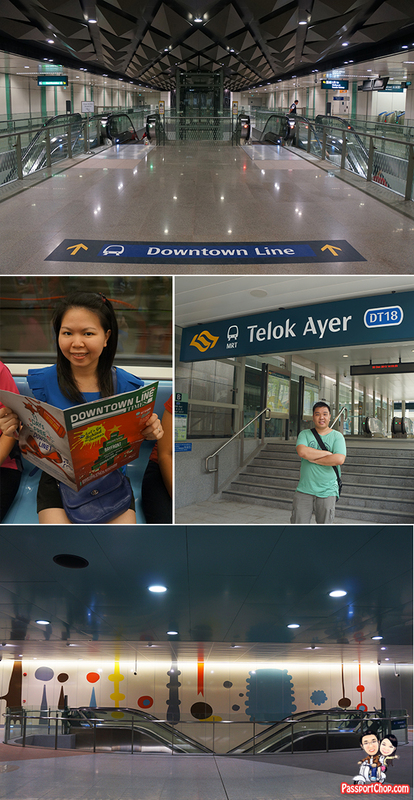 The Downtown Line (DTL) is Singapore’s fifth Mass Rapid Transit (MRT) line. When fully complete, the line will be about 42-km long with 34 stations and serve about half a million commuters daily making it the longest underground and driverless MRT line in Singapore. It will be completed in 3 stages with 6 stations of Downtown Line 1 (DTL1) from Chinatown to Bugis completed in 2013, 12 stations of Downtown Line 2 from Bukit Panjang to Bugis to be completed in 2016 and the 16 stations of Downtown Line 3 in 2017. 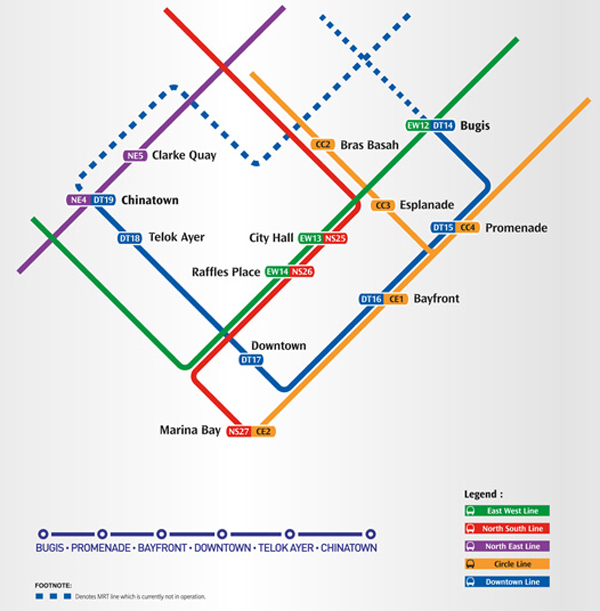 The Downtown Line will facilitate direct travel from the northwestern and eastern areas of the island to the Central Business District (CBD) and the Marina Bay areas. Four of the DTL1 stations are interchange stations with the North East, East-West and Circle Lines, which will allow commuters to transfer conveniently with the rest of the rail network. One thing I have noticed about the DTL1 stations e.g. Bugis, Telok Ayer is the coverage of the sheltered linkways from bus stops or nearest commercial buildings to the MRT stations. 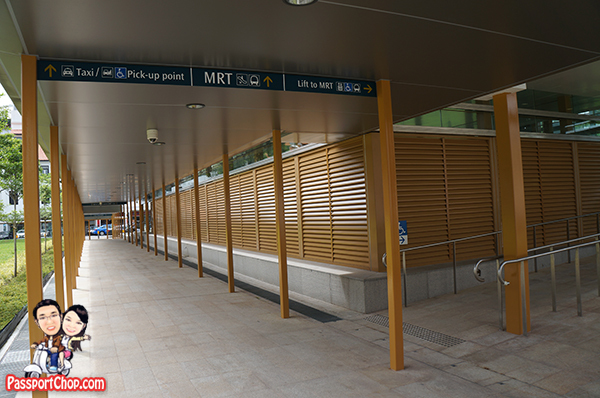 It is heartening to see parts of the Land Transport Master Plan 2030, specifically the part on 200 kilometres more sheltered walkways throughout the country being implemented at DTL1 stations. This specific Land Transport Authority (LTA) initiative – Walk2Ride programme will make it easier for commuters like us to walk to MRT stations or bus interchanges, as more sheltered linkways will be built within a 400m radius from all existing transport nodes, compared to the current 200m radius. LTA will also link up developments within a 200 metre radius of all bus interchanges, LRT stations and high usage bus shelters. Sheltered walkways connecting subway stations to bus stops or commercial buildings are almost non-existent in other countries – some reasons include high cost of implementation and the proximity of the nearest building or bus stop (they are located too far away from each other!). 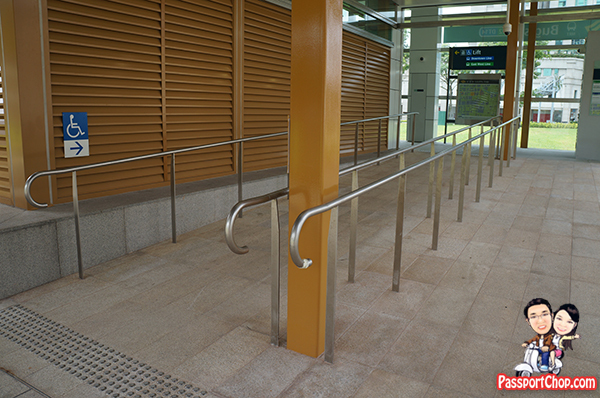 Each of the DTL1 stations are also equipped with barrier-free facilities e.g. ramps and lifts. 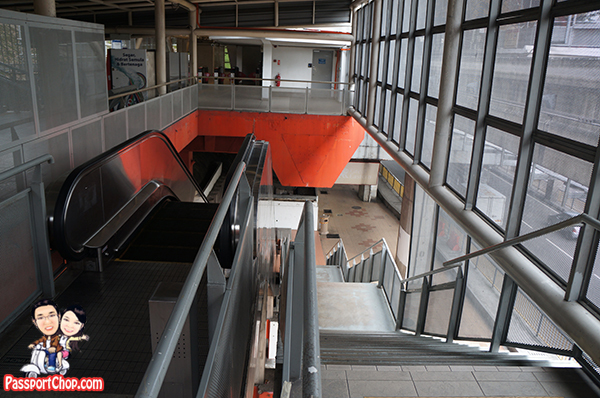 There are lifts at the ground level of each station which would bring commuters to the concourse level of the station. After entering through the faregates of the station, lifts are also located on this level to the platform level of the station. There is also at least one barrier-free entrance in every DTL1 station and wider fare gates (for wheelchairs and prams as well as those with big luggage). 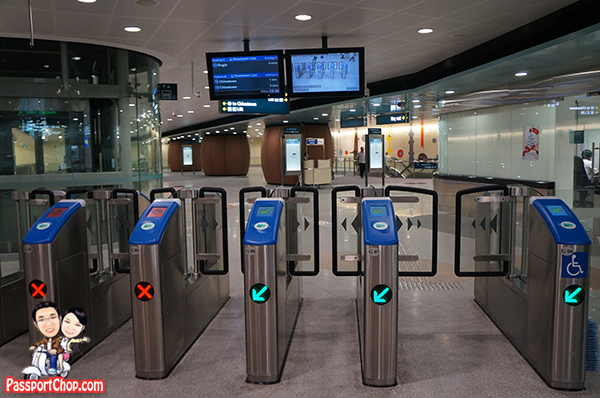 It is good to know that more than 80% of Singapore’s MRT stations have at least two barrier free access routes. 40% of the existing MRT stations are fitted with extra lifts to improve accessibility for less mobile commuters like the elderly. Having travelled on other subway systems around the world (and lugging along a heavy luggage), I am very thankful for the barrier-free facilities available at our DTL1 stations. 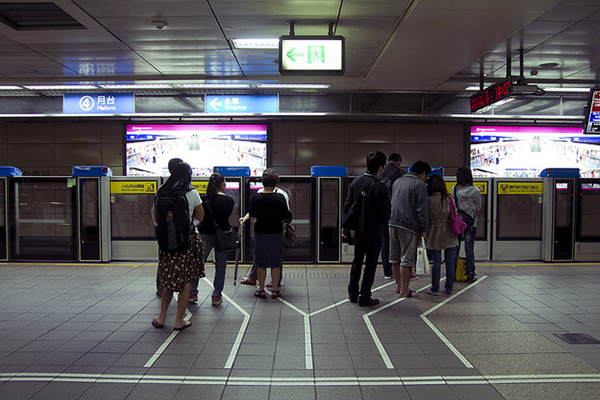 Lifts are almost non-existent in most of Beijing’s subway stations; where there are escalators, it is usually available on just the up-riding side e.g. in certain Kuala Lumpur’s monorail stations. 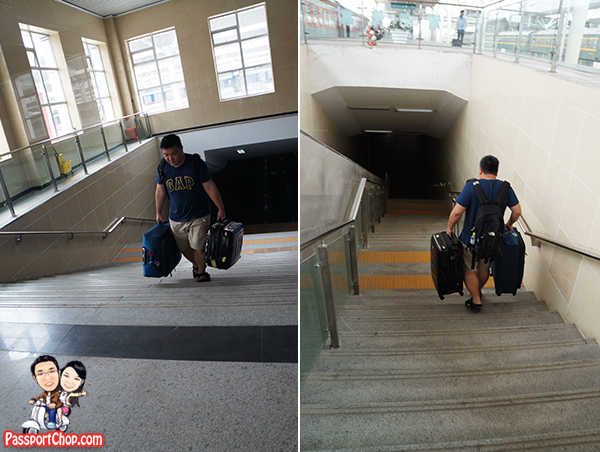 I will just have to carry my heavy luggage up and down the steps (as seen in the picture below) – it would have been impossible for the wheelchair-bound to take public transport in those countries. 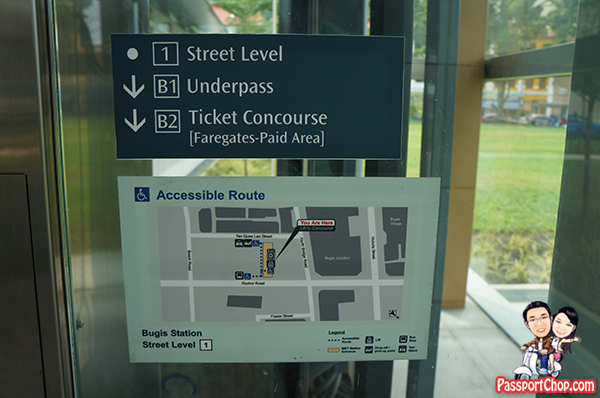 What impressed me was the efforts put in by LTA to guide commuters on an accessible route they can take from the DTL1 stations (see the “Accessible Route” notice pasted by the side of the lift) – this will be very useful for commuters or tourists unfamiliar with the areas around the stations. 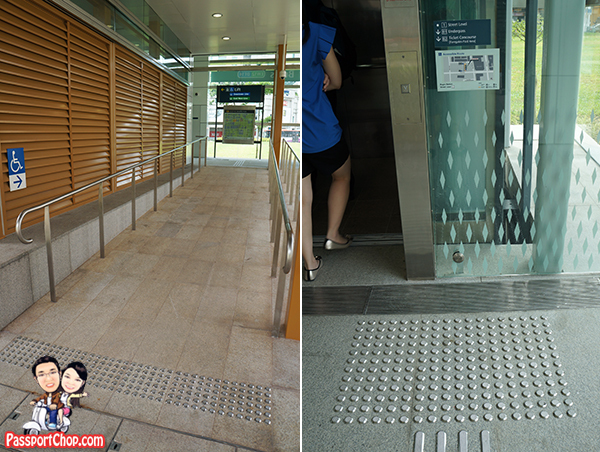 I had also noticed that tactile flooring on most parts of the DTL1 stations – especially at the ground level to guide the visually handicapped commuter to the barrier-free facilities e.g. ramps and lifts. Tactile flooring comprises tiles with raised surface of rounded and elongated studs. The former indicates direction of walking and latter are decision points. These tactile tiles are laid to form a route within station, which would assist a visually handicapped commuter from the time they arrive at a designated station’s entrance to a waiting point at platform area and wait for train to arrive. There are also indicators that lead to the Passenger Service Centre and the disabled-friendly toilet located at the station. Another interesting feature of DTL1 stations is the Art-in-Transit programme where commuters can find public art in MRT stations – each station’s art work is carefully chosen and integrated to reflect the unique identity of each station and the community around it. For example, at Bugis DTL station, we saw a black diamond-like ceiling (see picture below) – this reflects the Bugis culture’s traditional “ikat” (diamond) motif. The artpiece is titled Ephemeral by Patrick Chia. Another interesting artpiece is Charm of Bay by Lim Shing Yee, located at Telok Ayer station. Historically, Telok Ayer, meaning ‘bay water’ in Malay, is a coastal street along the bay and the main landing site and focal point of settlement for Chinese immigrants. Charm of Bay celebrates the history of the area using abstract forms inspired by plantations and elements of water, each pointing or relating to the next as if passing on a tale about the past. I have to say these artpieces at the stations are way too abstract for me but still it adds colour to what would otherwise be just another MRT station. The Downtown Line’s fleet of trains is fully automated and driverless. 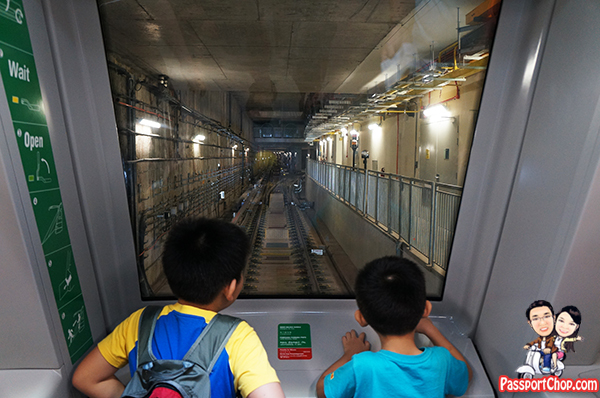 Driverless trains are currently used to service the existing North East Line and Circle Line but still the view of the train zooming down the tunnels fascinates me and I am sure this journey on the DTL will be quite exciting for kids as they fantasied about driving the train through the tunnels. In Taipei, we noticed that the Taipei metro authorities have adopted a very interesting approach in managing commuter flow into and out of the train. 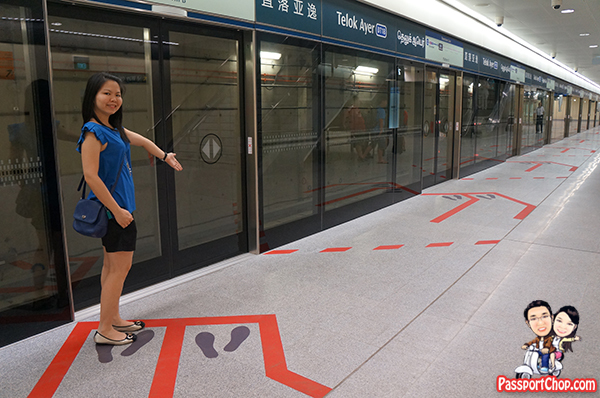 The queue markings on the floor are designed such that those waiting to board the train will stand on just one side of the train door (as shown in the picture below) – this gives the alighting passengers a much more wider space to get off the train. I observed that this is a much more efficient and effective method as the alighting process is much faster and also reduces the probability of the alighting passengers from being hemmed in by anxious travellers from both side. The queue line design at Telok Ayer and Promenade DTL1 stations are drawn in a similar manner as those in Taipei metro stations i.e. all boarding passengers will queue on one side of the door. For the DTL1 stations at Chinatown, Downtown, Bayfront and Bugis, a modified version of the existing queue markings used in other MRT stations had been adopted. This modified design has a bigger “funnel” for commuters entering and exiting the trains (as shown in the picture below). I note from LTA’s website that they are reviewing the effectiveness of these two new designs before deciding on introducing them to other stations. 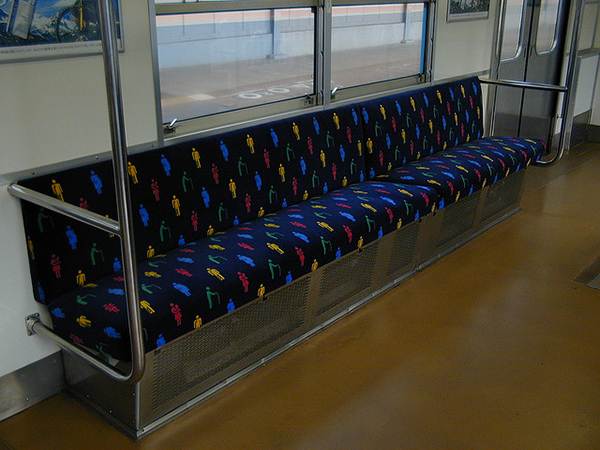 Tokyo’s metro has a rather innovative way of ensuring that priority seats really go to those in need. 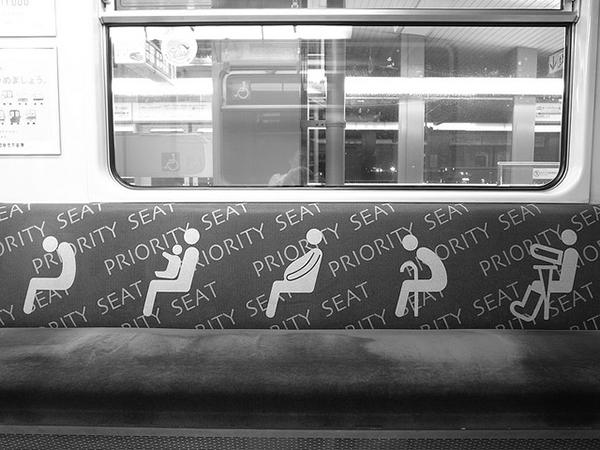 Instead of just putting up notices encouraging people to give up their priority seat to someone in need, they have instead made the priority seats very obvious by labelling the entire seat! There are a few examples as seen in the pictures below. The new DTL trains also had priority seats with very striking designs which will hopefully signal more clearly the seats’ intended use for commuters with mobility needs. 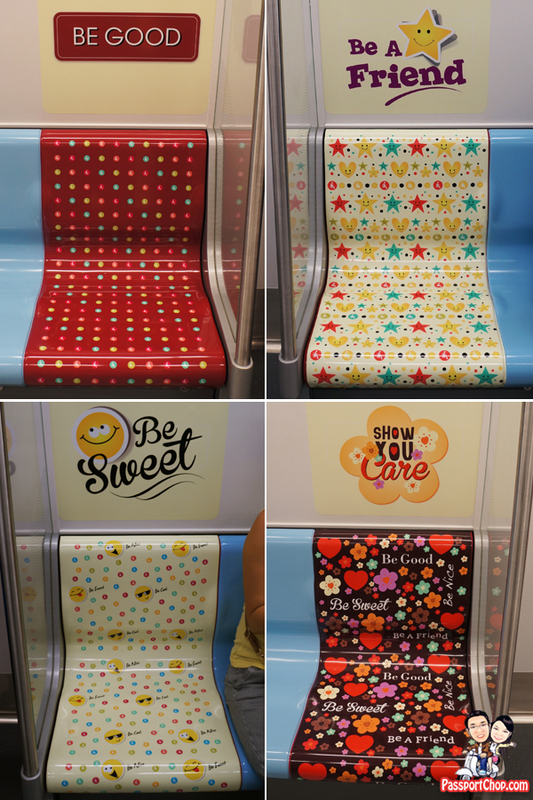 There are currently four new reserved seat designs on the DTL1 trains (as shown in the picture below). Commuters can vote for the design which they feel would be most effective through SMS or Facebook until 1 February 2014. The result of the polls will help determine which design for reserved seats will be applied to all DTL1 trains. I thought the “Be Sweet” and “Be a Friend” designs looked quite good. If you want to know what to do and eat around the DTL1 stations, check out LTA’s facebook page for some good recommendations of eating and shopping places around the stations. You can also follow them on Twitter @LTAsg!